Android devices running 4.0 or later don’t have a built in option to show a drive letter when connected to a PC. Luckily my favorite tool – Total Commander can deal with this pretty easily. As most Total Commander fans know, it’s the swiss army knife of file management. Now there is an easy way to create that left / right control to manage your Android. Follow the below steps to enable this feature. From Total Commander on your Windows PC select the Start menu and then “Change Start Menu”. Click “Add item” and call it “Android” or any other name you wish. 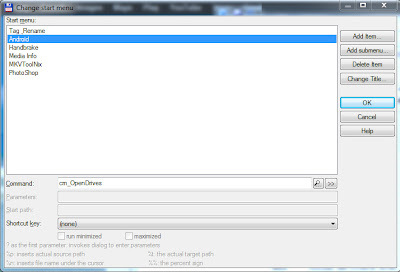 Then look towards the bottom for the “Command:” area and enter the following: cm_OpenDrives and then click the OK button. Now try your new start menu, select “Android” and you should be presented with a list of drives on your Windows PC. There should be a device on the bottom that is your Android device. Double click it and now you have a left / right scenario to copy/move your content. Christian Ghisler (the author of Total Commander) is amazing. 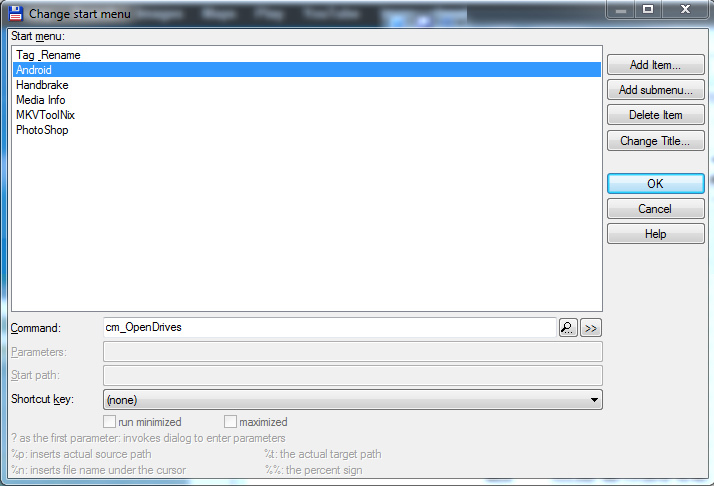 Sadly, file search does not work in Total commander. I will have to tell Christian. This work-a-round in Total Commander to get a drive letter for my cell phone is so good, is it too good to be true? That is going to be a USB driver issue with your Android phone. I would check and see if you can get updated drivers. You can also verify from start button, computer. You should see your phone there. Try a copy from Windows and see if it locks up. I apologize for this but I can't synthisize very well. 1. where do I get drivers updated for my Samsung Galaxy Note 2 cell phone?,,,and what drivers are they?,,what are their file names, .... how do I get them,/install them, etc etc. 2. I don't know what you mean about verify from the start button on my computer to see if my phone is there. (note, I am using windows XP by the way).....I click on START in the windows tray at the lower left bottom, and I don't see any phone listed, just my usual folders and files. Like I said I am not to well versed and need a step by step, result by result, blow by blow directions etc for me to understand what to do and what to expect. Download the latest Kies app from the Samsung site and install it. It will have the latest drivers. When you click the Start button in Windows there is something called Computer, or My Computer depending on the version of Windows you have. I have Windows 7, I can't remember exactly what XP has anymore. When get to that area the phone will show up as a device and you can copy / paste files to it. This is only to make sure Total Commander is not the issue. It's most likely not Total Commander. When TC is working correctly there is no drive letter, it will just show up on the right or left side in TC. Awesome! Works great. Except... I don't see all my folders. I'm guessing they're either hidden or something. Not sure. On my Nexus4, using Root Explorer I can see some folders on my Storage (SD) drive - but in TC can not see those. Any clue? You must be seeing some folders? On my external SD card for example I have a DCIM, LOST.DIR and Music folder. Under those folders I have many more folders. The on the phone itself I see 33 folders. Not all of them since some are system stuff. Thanks for the great tip, Haven't used the start menu much in TC. Question though... I don't seem to have the file details (ext. size, date, etc.) It seems that when I browse using windows explorer I see the lack of that info too. Is this because it is connected as an MTP device? I have a similar problem as above not seeing all the folders in my Acer Iconia A1-830. After installing the TC plugin Android ADB V 7.6, I can see everything but the hidden folders. With the procedure above I can see the hidden folders but not all viewable folders. Is this a driver problem? Can anyone help with this? Absolutely great tip, works like charm. Thank you. Brilliant: to see my phone in my favourite file manager TotalCommander! I can see my Samsung Note2 in Total Commander but is there a way I can assign a drive letter to it? All data recovery programs I've tried require drive letter before they can start the recovery. Thanks! The protocols (MTP and PTP) used are not going to allow a data recovery program to work because they don't have access to the true file system. They are simple file transfer protocols. I would think the only option is to find a data recovery app that runs on the phone itself. Overall best option is to keep all the important data on the micro-SD card if your phone has one so it can be removed and accessed on a PC for recovery. Thanks Gary for your advice. Will definitely do so going forward! Gracias genio! Luego de mirar cientos de plugins y resulta que tú lo haz hecho simple y fácil. Thank you soo much for the tip with adding the "Computer" to TotalCommander. I must admit that I have never ever looked into that corner of TC, must else check what the stuff there can be used for. I would like to be able to use TC's impressive move/copy operation commands with my android device. For instance, I would like to be able to issue a command to skip all older files when copying to my phone. Now, it will only open up native windows explorer copying window. Thank you very much for your great post, it helped me a lot! Great !!!! but how can I synchronize my Android with my PC ? not supported ? Works fine for me. Thank you very much. You sir are full of awesome. Hats off to you & thank you very much. Made my day. Have been using MS Explorer for the purpose. No more. If you ever run for The President of Earth, you've got my vote. Amazing, and it still works. Still valid for a Sony Xperia 5C in 2018!